Woman Sells $3,000 Ford Mustang Convertible For $600 In Beautiful Tribute To Father. One of our awesome Morning Smile readers sent us this story, and it’s too good not to share. She has asked to be kept anonymous, so we’ll just call her Mary. 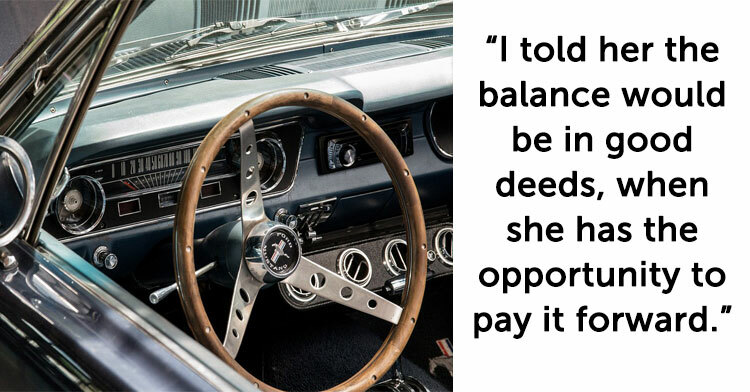 Mary’s father had a lifelong passion for “restoring cars back to their former glory.” In 2016, he purchased a Ford Mustang Convertible for $3,000. He’d been battling cancer for several years and knew he likely wouldn’t live to complete the renovation, so he gave the car to Mary. Then one day, Mary got a phone call from a woman hoping to purchase the car. “She did not have the funds to pay for it in full. However, she proposed a down payment of $600 and making payments. She was going to school for business at a local college and worked two jobs to make her way, using the bus to shuttle each way. Needless to say, I admired her fortitude to achieve her goal,” wrote Mary. Still, she couldn’t accept the woman’s offer. Two days later, Mary’s father passed away. “On the evening of his passing, I had such a heavy heart. I thought about that car,” wrote Mary. “I suppose it was a day of epiphany for me, as I called this woman who wanted the car and told her she could have it for $600. She said she would make arrangements to repay me. I told her this was my dad ‘paying it forward’ and he would want this. No additional money was needed. Just $600. I told her the balance would be paid in good deeds, when she has the opportunity to pay it forward to someone else.